The Biofuels Basics page gives a brief overview of a myriad of concepts, issues and technologies realted to biofuels and advanced biofuels. Technical Challenges: If it’s such a great idea, why hasn’t it been done before? Fulfilling the Promise of Advanced Biofuels: What Will It Take? The primers are another good place to start to learn about biofuels made from non-food, non-feed, sustainably grown feedstocks, including agricultural and food processing waste, algae and other substances. They are designed for classroom use and can also be used by church and civic groups discussing stewardship or current affairs. They include not only charts, graphs, photos, illustrations and information; but also questions for discussion or for further research. Potential growers and investors will find a list of questions and considerations relevant to those contemplating becoming more involved in research, development, production and deployment of advanced biofuels. The page also includes links to some pertinent resources. 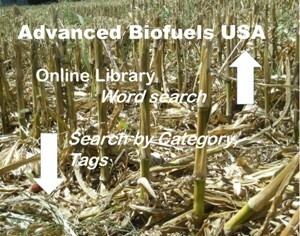 This site also lists companies and organizations involved in advanced biofuels in the Resources section. Government resources and lists of advanced biofuels-related job list sites are also accessed in the Resources section. Many different technologies and feedstocks are subjects of research and development. For a brief history of some of those technologies, with emphasis on technologies using algae, see Will Thurmond’s Biofuels Digest article. For other articles, click on the category to the right of this page that includes your area of interest. Enzymes 101: Biofuels Digest published a brief description of enzymes and summarized breakthroughs in enzyme development through early 2010 and their potential impact on commercialization of cellulosic ethanol. KQED’s 10 minute video, Biofuels: Beyond Ethanol explains advanced biofuels and current research being conducted to turn the material in plant cell walls (of switchgrass, corn stover, poplar, etc.) into “drop-in” fuels. Advanced Biofuels USA 2010 Hood College intern, Emir Dogdibegovic, prepared a presentation and paper for his honors class based on his research and work for the organization, “The Future of Transportation Fuels and Improved Ecological Plans Lies in Advanced Biofuels.” It presents an overview of social, economic, and environmental issues along with a survey of many of the technologies currently being pursued to produce advanced biofuels. He introduces technological challenges, and presents his view of some things that need to be done to accomplish the promise of advanced biofuels. The paper is designed to accompany this presentation. A full definition includes practical and legal elements. Generally, advanced biofuels can be thought of as liquid transportation fuels derived from: low nutrient input/high per acre yield crops; agricultural or forestry waste; or other sustainable biomass feedstocks including algae. 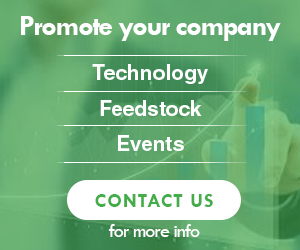 This entire web site is dedicated to helping people understand what advanced biofuels are, how they are used, research being conducted to convert biomass to biofuels, and the economic, political and social aspects of developing, producing, distributing and using advanced biofuels. 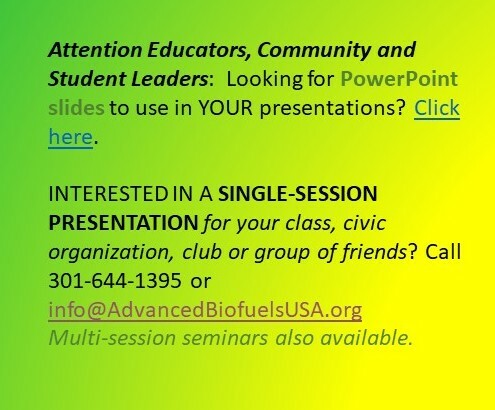 For links to other educational materials about advanced biofuels, click here. 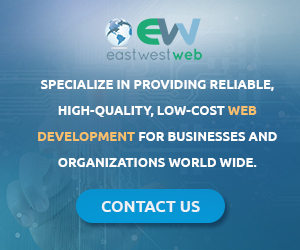 For more information on how to use the site, click here. Enjoy the site. Enjoy learning about this truly sustainable renewable future. If you have any comments or suggestions–or questions about advanced biofuels that have not been addressed on the site, please contact us at info@AdvancedBiofuelsUSA.org.